DVV Solutions, specialists in Third Party Risk Management, are proud to announce our co-sponsorship of CeFPro’s 4th Annual Vendor & Third Party Risk Europe seminar. “We’ll be bringing valuable insight into innovative and collaborative approaches to Third Party risk management (TPRM) practices that can improve both the quality and efficiency of regulatory compliance and risk management programs. We hope to enable attendees to better understand how they can improve the visibility and management of compliance and risk between themselves and their Third Party suppliers.” explained Sean O’Brien, DVV Solutions Managing Director. During the event Sean O’Brien, MD, DVV Solutions will be joining an interactive Cloud technology panel discussion and Q&A. He’ll be discussing how to ensure effective controls for cloud providers to understand where data is stored and pinpoint liability and explore the benefits and pitfalls of technologies and tooling that can help you develop more effective and efficient risk assurance practices. The DVV Solutions team will also be available throughout the day to offer advice and guidance on building and delivering best-practice TPRM programs for executives and managers responsible for Risk and Security Assurance, Supplier Relationship Management, IT Security and Procurement. “We are seeing a greater focus placed on the development of more robust Enterprise Risk Management (ERM) frameworks to ensure “Operational Resilience”, driven by the scrutiny being placed upon organisations by regulators, such as the FCA’s Senior Managers and Certification Regime (SM&CR), that is increasingly placing responsibility and accountability for the oversight of policies, security controls and due diligence directly on specific senior executives. 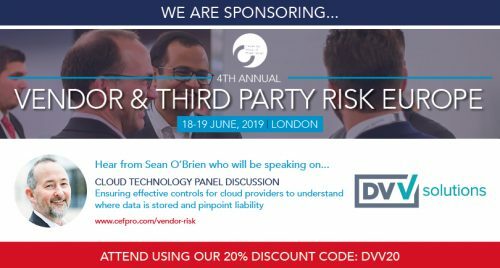 We look forward to the opportunity at Vendor & Third Party Risk Europe to share experience with key risk management and assurance stakeholders and guide them through what is a challenging undertaking.” added Mr. O’Brien. The Center for Financial Professionals (CeFPro) is an international research organization and the focal point for financial risk professionals to advance through renowned thought-leadership, knowledge sharing, unparalleled networking, industry solutions and lead generation. CeFPro is driven by and dedicated to high quality and reliable primary market research. It is this market research that allows us to provide an excellent portfolio of peer-to-peer conferences, live interactive webinars, industry led content and a membership area for the industry to connect. Vendor & Third Party risk management is gaining, year after year, more significance in the risk process for every financial institution. Many areas need to be considered: new regulations to implement, different jurisdictions in which to be compliant, high-end technologies developing in cloud storage and data collection. The industry needs more platforms where to gather, discuss and try to standardize approaches, both on the regulatory and on the outsourcing sides. Industry wide, assessing concentration risk, operational resilience, reporting issues and data protection will help businesses to improve their performances. 20% Registration Discount: Register online and enter code “DVV20” for 20% off all delegate passes, including Early Bird Rates.